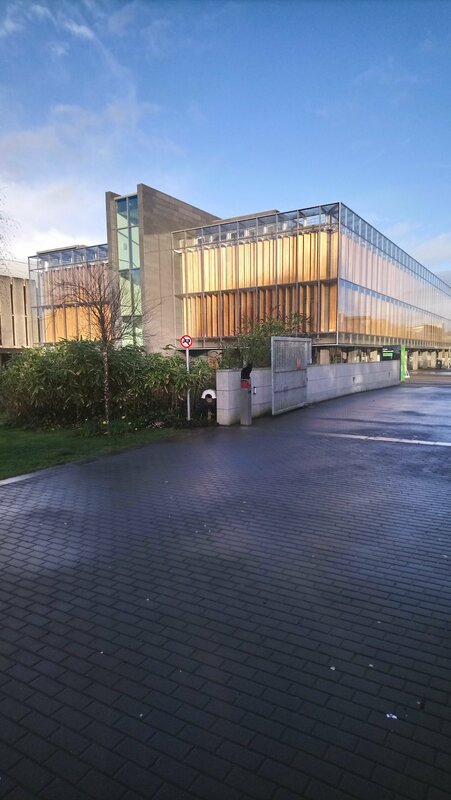 Well, today is the first day of the Quality Review Panel visit to the Department of Theoretical Physics at Maynooth University. It has come up very quickly; I blogged about the preparations some weeks ago. More surprisingly I learn that said cat now has his own Twitter account, so please give him a follow! I had to come into the office today to do a few things ahead of what will be another busy week, but when I stepped out I found the weather to be much more pleasant than it has been of late, so went for a short stroll around the town of Maynooth. I’m also house-hunting, so I took the opportunity to have a look at the locations of a few properties I’d seen on the market before deciding whether to check them out in more detail. Anyway, at the opposite end of the Main Street from the Maynooth University campus, I found the above monument, the Tree of Liberty Stone, which commemorates the (failed) Irish Rebellion of 1798 which had sought to emulate the French Revolution (which began in 1789) in overthrowing British rule in Ireland. This rebellion was launched by the Society of United Irishmen. Incidentally, one of the founders and leading lights of the Society of United Irishmen was a character from Belfast by the name of Henry Joy McCracken. That name will be familiar to many astronomers, and especially to people involved in the European Space Agency’s Euclid mission, as there is an astronomer with exactly the same name who did his PhD in Durham and who now works in Paris. Whether the present Henry Joy McCracken is directly related I don’t know. The historical Henry Joy McCracken was executed by public hanging on 17th July 1798 after the failure of the 1798 rebellion. He was just 30 years old. Another thing worth mentioning is that he was a Protestant republican. There were more of those than people tend to think. Although they’re less numerous in Maynooth than Rooks and Jackdaws, I have seen a few of these birds around the place but they’ve always been reluctant to stay still long enough to be photographed. This is a Hooded Crow and it inhabits the same ecological niche as the Carrion Crow, which has all black feathers; a Hooded Crow looks a bit like a Magpie but instead of sharp black and white it is scruffy dark grey and off-white. I’ve never seen a Hooded Crow in England or Wales but apparently they are prevalent in Scotland and Ireland. It used to be thought that Hooded Crows and Carrion Crows were just regional variations of the same species, but nowadays they are regarded as distinct. Anyway, I wondered why this one was not as shy as the others I have seen until I looked down. So here we are then. The Autumnal Equinox (in the Northern hemisphere) took place in the early hours of this morning, at 01.54 UT (which is 02.54 Irish Time) on Sunday 23rd September. I was, of course, sound asleep during this momentous event. People sometimes ask me how one can define the `equinox’ so precisely when surely it just refers to a day on which day and night are of equal length implying that it’s a day not a specific time? The answer is that the equinox is defined by a specific event, the event in question being when the plane defined by Earth’s equator passes through the centre of the Sun’s disk (or, if you prefer, when the centre of the Sun passes through the plane defined by Earth’s equator passes through the centre of the Sun’s disk). Day and night are not necessarily exactly equal on the equinox, but they’re the closest they get. From now on days in the Northern hemisphere will be shorter than nights and they’ll get shorter until the Winter Solstice. The weather is unsettling. It’s warm, but somehow the warmth doesn’t quite fill the air; somewhere inside it there’s a chill that reminds you that autumn is not far away. I find this kind of weather a bit spooky because it always takes me back to the time when I left home to go to University, as thousands of fledgling students are about to do this year in their turn. Indeed tomorrow, Monday 24th September, is the first day of lectures for the new term in Maynooth. The new students have been going through various induction and orientation processes for a week or so already, but their first encounter with actual teaching will be to morrow. I don’t actually take the stage until Tuesday, on which day both my new modules start. The second years will get Vector Calculus and Fourier Series while the fourth years get Astrology and Cosmetics Astrophysics and Cosmology. That is assuming that I take the right notes to the right lectures. Looking back to the corresponding equinoctial piece I posted last year brought it home to me just what a strange year has passed. On 22nd September 2017 I visited the Office of the Consulate of India in Cardiff to lodge an application for a visa for a trip to attend a conference in Pune, watched a bit of cricket, then some work preparing for the launch event of the Centre for Doctoral Training (CDT) in Data-Intensive Science that was about to take place. I was only working part-time in Cardiff then. 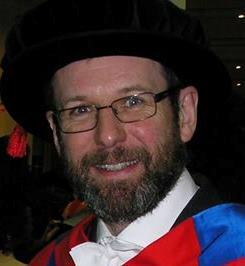 Although I no longer work at Cardiff University, I still hold it in great affection and wish it all the best. I heard on the grapevine that it has been a good year for undergraduate recruitment in the School of Physics & Astronomy, which is excellent news, and the Data Innovation Research Institute also seems to be thriving. No doubt I’ll bump into various members of staff on occasional visits to Cardiff, at least until such time as I sell my house in Pontcanna. At the time of last year’s autumnal equinox I hadn’t even been interviewed for the job I now hold in Maynooth, and had no inkling that within a year I would have relocated to Ireland. I actually took an hour out of the CDT event to be interviewed via Skype over a crappy Hotel internet connection. I thought it went terribly badly – I hate Skype! – but I ended up being offered the job. I was able to put in a quick visit to Maynooth to confirm the details before going to India as planned. I’ve been so busy flitting back and forth betweeing Ireland and Wales during the last 12 months that I haven’t really had time to reflect properly on how extraordinary life is that it can change so much as a result of lucky coincidences! Anyway, I think that’s enough rambling for now. I’ve got a couple of problem sets to put together. Let me end by wishing the new and returning students at Maynooth and at Cardiff all the best for the new academic year. Work hard, and enjoy your studies, but don’t forget to enjoy life on the way! I took the above snap this morning walking back to the Science Building. It shows the view from the other side of St Joseph’s Square compared to the picture I posted on Tuesday, i.e. towards St Patrick’s House rather than away from it. The weather has taken a turn for the worse since Tuesday, and it’s decidedly autumnal today but it’s still not a bad view to be greeted with on the way to the office. Back in the office with a few minutes to go before a meeting starts I thought I’d give a little insight into life in the throbbing metropolis that is Maynooth, County Kildare. 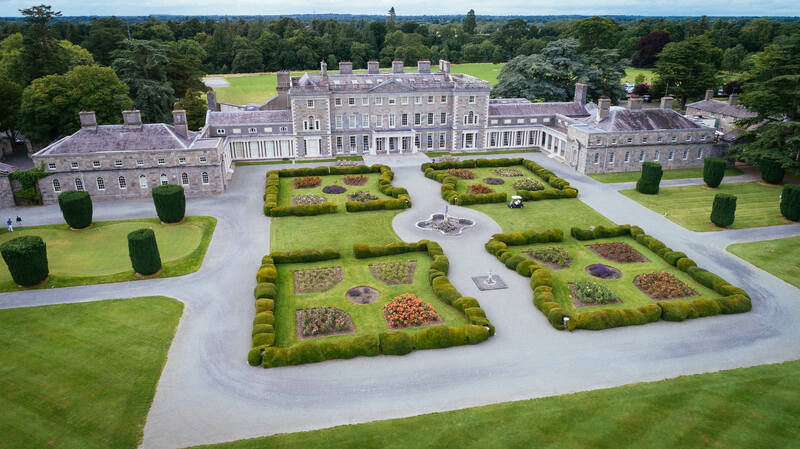 This week sees the start of the World Amateur Team Golf Championships, which is being held at Carton House (above) which is a short walk from downtown Maynooth. Some of the competitors will be staying on Maynooth University campus for the duration, which will no doubt provide welcome revenue. Now the game of golf is obviously of no conceivable interest to anyone, but the venue – Carton House – is quite fascinating. The current house was built on the Carton Estate in the 18th Century to accommodate the Earl of Kildare, when their fortunes had slowly recovered after Thomas Fitzgerald (`Silken Thomas’) the 10th Earl of Kildare was executed, along with several others of the Fitzgerald family, by Henry VIII for plotting a rebellion against the English. If you have been paying attention you will know that it was the Fitzgeralds who built the stone castle in Maynooth that was destroyed in the 16th Century. Carton House is at the other end of town, and is approached by a very pleasant tree-lined avenue. The extensive grounds are also surrounded by a wall. The latter-day Fitzgeralds obviously wanted to keep the hoi polloi at arm’s length. Anyway, to cut a long story short, Carton House fell into disrepair in the second half of the 20th Century and was eventually sold off and turned into a hotel and spa resort, with two golf courses. In the meantime, among many other things, Carton House and it its grounds were used as one of the locations for Stanley Kubrick’s (1975) film Barry Lyndon. That was of course before the beautiful landscaped gardens were destroyed and turned into golf courses. I went for a pleasant walk in the grounds earlier this summer, during the heatwave, but the path runs alongside a small lake beside one of the fairways where a group of people were openly committing acts of golf. A not-very-competent member of this group sent several balls into the water before finally managing to hit dry land with a tee shot. For a while I wished I’d brought a tin hat with me.